McDonald's said that they are going to send a team to review this. 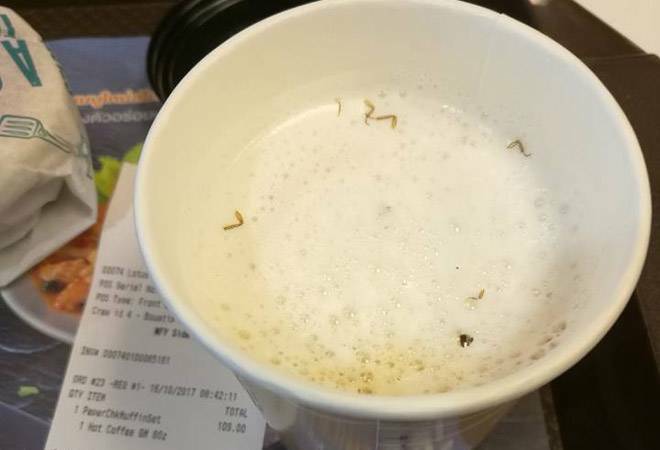 A man in Thailand found several cockroach legs floating in his cup of coffee. He took to Facebook to make his displeasure known and the post swiftly became viral. The Thai man, who goes by the name of Nostalgic Eik posted an account of this horrifying incident on the McDonald's page. The post has been shared more than a thousand times and has received more than 14K reactions till now. The customer wrote on the McDonald's page that he had gone to their outlet at Lotus Rama 4 in Bangkok and ordered a cup of coffee. The coffee appeared to have some brown bits floating on it, which he realised, was cockroach legs. He soon took the matter to the counter and was given another cup of coffee, which had more cockroach legs. He writes that he expected McDonald's to have a better standard of cleanliness and also asks how is it possible that the employee who poured him the coffee did not notice this. McDonald's issued a statement two days later and apologised. They said that the coffee pot indeed had cockroach legs. They also said that they are going to send a team to review this. Unfortunately, incidents like this are not uncommon in eateries of fast food chains. In September this year, a customer complained of finding insects inside oregano satchets given by Domino's Pizza. He said that he opened every satchet he had recieved and found insects in them. Domino's issued a statement clarifying that they check all their condiments before sending them out.